Great Sale Prices! 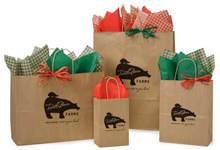 Recycled brown kraft paper gift bags with handles are perfect for retail use! Bakery Boxes and cupcake boxes in pink, white & chocolate. 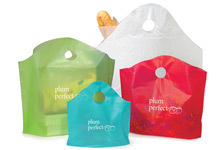 Plastic retail bags with a wave top design and die cut handles. Clear plastic containers, lids & shrink bands for food and cookies. Available in many sizes and styles! 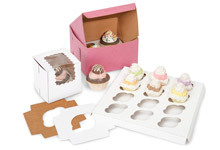 Cupcake box inserts for standard and mini size cupcakes! Natural unbleached food safe tissue is compostable and biodegradable! Glassine candy bags are grease and moisture resistant. Compostable and Biodegradable portion bags in Kraft or green swirl. 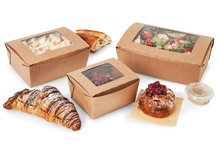 Solid Kraft or window BioPlus Earth® takeout boxes in several sizes. FoldPak® Chinese wire handle takeout boxes in recycled Kraft or white. 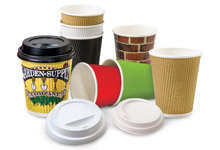 Groove insulated paper coffee cups in several designs and sizes. 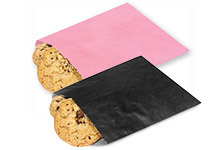 Paper candy bags in popular colors are wax lined, grease and moisture resistant. 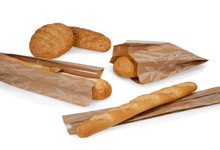 Design, quality, and sustainability are important factors to consider when choosing food packaging supplies for your bakery, restaurant, coffee shop, or other food service business. Knowing your main concern as a food business is in the creation of an enjoyable menu, we strive to make it easier on you when it comes to packaging. This is done by having a huge selection of attractive ecofriendly food service supplies in stock and ready to ship directly to you. Ensuring you have the products you need to run your business with efficiency and pride. Recycled take out containers have poly liners which help maintain the desired temperature of food. The liners also help prevent leaks and are grease resistant. Aside from the solid natural Kraft take out box, we also have some available with windows and Sonoma designs. 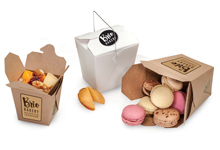 Chinese takeout boxes are available in white and brown natural kraft paperboard. Each color option is available in four different sizes and they all come preassembled for added convenience. Plastic food containers are sold in a variety of sizes and shapes. Some containers have dividers which allow for a more diverse arrangement of products to display and sell. 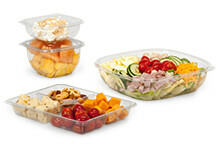 Plastic lids and shrink bands are also available to seal your plastic food packaging. 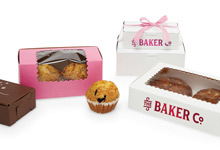 Bakery boxes have a large selection of sizes and colors with some window options as well. We even have specialty black bakery boxes that ship from the manufacturer. Cupcake inserts, cake pads, and bakers twine add functionality to our cake boxes. Food Bags have an exuberant number of uses; including breads, cookies, or small gift and appeal items. 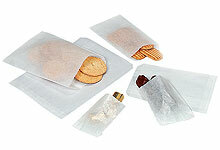 Clear Cellophane Food Bags, coffee bags, and candy bags are some of food bag options we offer. By creating custom packaging specific to your business or simply placing your logo on boxes, ribbons, and bags, you set yourself apart from all the other businesses out there doing what you do. Custom labels are easily placed on plastic food containers, glassine bags, or small bakery boxes. Custom coffee cups are a walking advertisement. 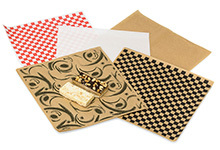 We have the capability to bring you the style you need with fully customized packaging. Call to speak with one of our custom specialist Monday through Friday 8 am - 5 pm CST at 1-800-547-9727.